Paris is the heart of France’s chocolate industry—and sheer heaven for chocolate lovers. 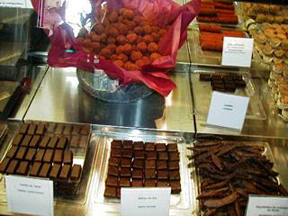 There are many boutiques run by world-class chocolatiers throughout the City of Light that should not be missed by sweets connoisseurs. One of my favorites is the Left Bank shop run by master chocolatier Christian Constant. Constant (not to be confused with the renowned Parisian chef and restauranteur who shares the same name) has been a mainstay on the Rue d’Assas in the 6th Arrondissement since 1970, and his signature shop near the Jardin du Luxembourg offers up some of the city’s tastiest chocolate treats—all of which can be enjoyed at the shop’s adjoining tea room. The shop’s signature chocolate products are those that blend unusual flavors with dark, milk and white chocolate, including such essences as orange blossom, jasmine, cardamom, ylang-ylang blossoms, rose-scented geranium and verbena flowers. Constant’s ganaches, truffles and filled chocolates are paired with such flavors as rose, raisin, green tea, Tahitian vanilla flowers, Ceylan cinnamon, Chinese ginger, saffron, Cointreau, Champagne, whiskey, pine nuts, honey and sesame seeds, among many more. 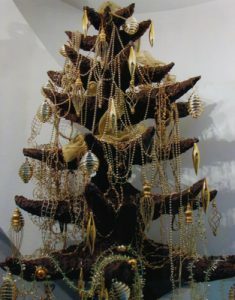 His “timeless specialties” include dark chocolate-filled ganache, gold-flecked chocolate coins, bitter chocolate truffles, coffee-flavored ganache, cappuccino-flavored ganache, Ceylon tea-flavored ganache, chocolate-covered Sicilian mandarin orange slices and chocolate-covered sweet orange rind. His award-winning chocolate bars come in such flavors as white chocolate with apricots, milk chocolate with pistachios, vanilla-bean infused dark chocolate, and a variety of dark chocolate bars ranging in cocoa content from 60% to 80%. In addition to chocolates, Constant’s boutique crafts a number of delicious chocolate pastries, with the Sonia Rykiel (a chocolate and banana tart) and the dark-chocolate ganache tarte being among the shop’s perennial favorites. 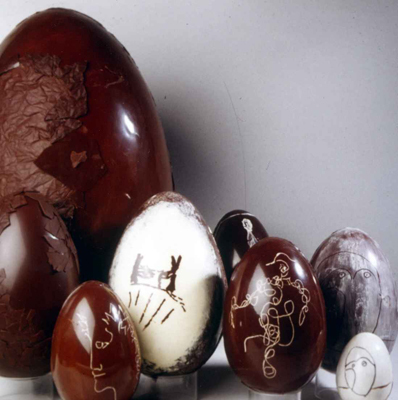 For a special treat, visit Constant’s chocolate shop before Easter, when the chocolatier prepares a number of elaborate Easter eggs and other holiday treats, and before Christmas, when the shop is filled top to bottom with inventive and delicious chocolate concoctions, gifts and desserts. During cold weather, be sure to stop by the tea room to try one of Constant’s five varieties of house-made hot chocolate, and the summer visit for the freshly made chocolate ice creams. Delicious! Constant has constantly honed his craft over the years, becoming one of the most renowned chocolatiers in Europe. 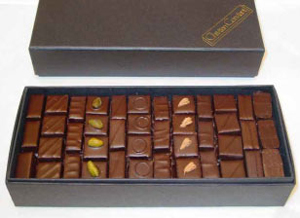 Among Constant’s many accolades are receiving the 2000 Eurochocolate Award, being named an Officier de l’Ordre des Arts et des Lettres (Office of the Order of Arts and Letters) by the French Ministry of Culture and Communication, being named to the 50-person French Academy of Chocolate and Confectionery and receiving a Diploma from the Club de Croqueurs de Chocolat. Chef Constant travels the world to obtain the finest ingredients for his chocolate creations, including the Caribbean, Madagascar and several countries in Central and South America.But he also is a strong supporter of sustainable food sourcing and a scholar of chocolate history. As such, he’s written two books on the history of chocolate-making: Le Gout de la Vie: Le Chocolat (Chocolate: The Taste of Life) and Du Chocolat, Discours Curieux (A Curious Discourse on Chocolate), which received an award at the International Wine and Cookbook Awards presented in 1999 by the Salon International du Livre Gourmand. Constant is currently writing a book about the impact of cocoa farming and chocolate commerce on several native North and South American cultures. 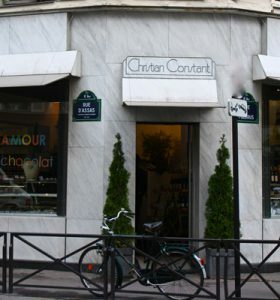 Christian Constant’s boutique and tea salon is located at 37 Rue d’Assas (Metro: Saint Placide/Rennes), and is open 9:30 a.m.-8:30 p.m. Monday-Friday, and 9 a.m.-8 p.m. Saturday and Sunday. He also operates a boutique in Tokyo, Japan. This entry was posted in Chocolatiers, Food, French culture and tagged chocolate, Christian Constant by Bob Adams. Bookmark the permalink.